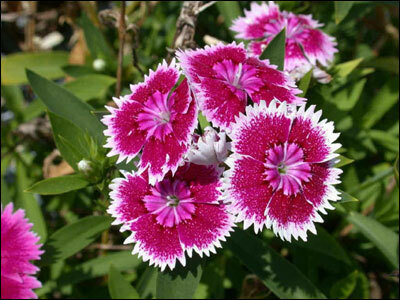 As a color, pink really came into its own during the Rococo period of the 17th Century. 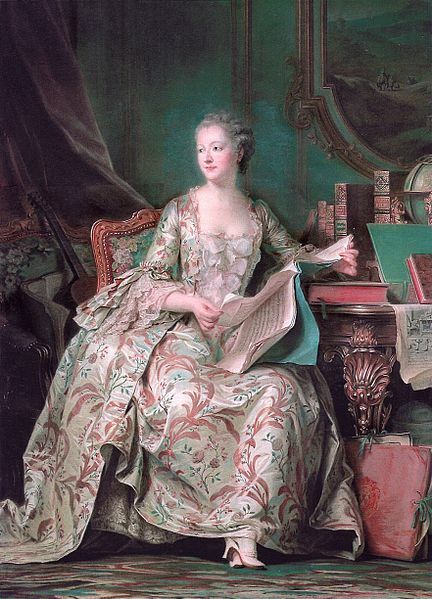 Portraits from this period and the 18th Century show pink as a color used for seduction (worn by two famous mistresses: Madame de Pompadour, mistress to Louis XV; and Lady Emma, mistress to British Admiral Horatio Nelson). 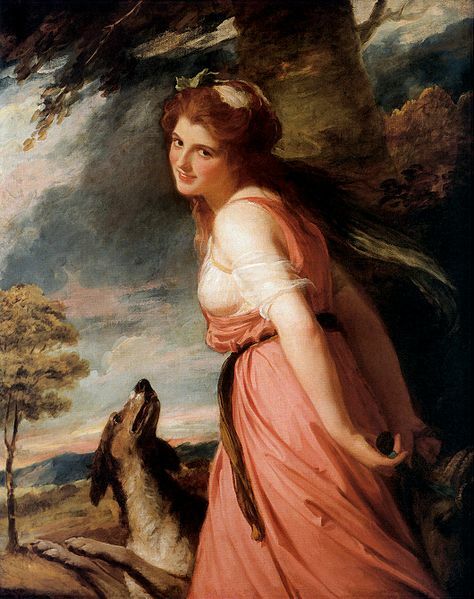 But then, take a gander of this Portrait of Francis Lind by George Romney. According to Christie’s, George Lind was descended from the military from both parents, and served in the Indian Civil Service himself. 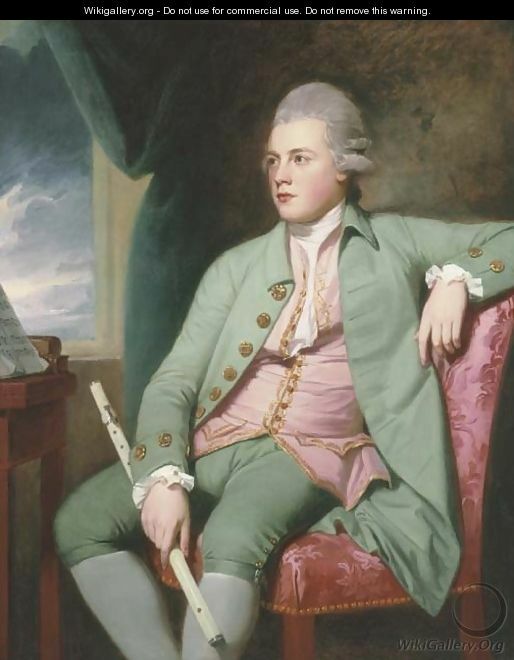 And here he is, just a guy with a flute sitting in a pink chair, wearing a pink vest. No big deal. 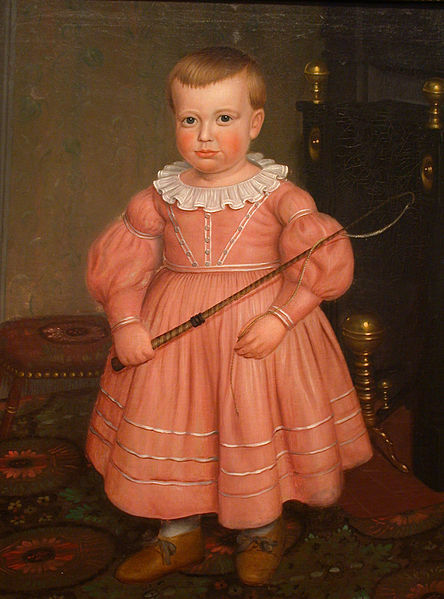 Moving into the 19th Century, red was a common color for men of this period, and boys thus wore pink. Think about the laundering process from this time- anything red would quickly fade to pink with the boiling water, harsh soaps and hand scrubbing; anything white would pick it up! There are two paintings from this period that stand out to me- both showing young boys wearing pink as a matter of course. 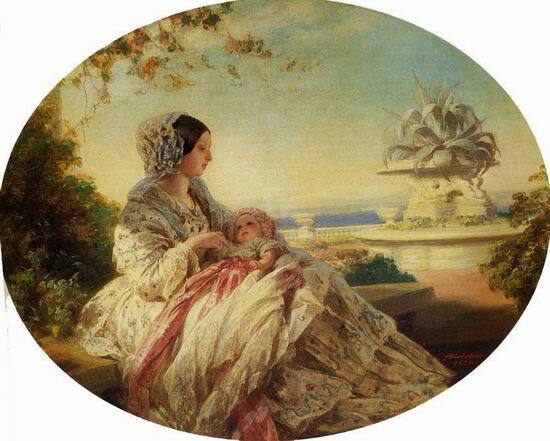 The first is Queen Victoria sitting with Prince Albert (image sourced from Wikipedia, but I couldn’t find any additional information); the second is an American Boy Holding a Whip (Anonymous Artist, circa 1840). To clarify, most children wore dresses well past toddlerhood into the early 20th century, and pink was far more likely to be chosen for boys than it was for girls since it is a much “stronger” color as a relative to red. So now, the 20th Century. This NPR article has a great quote: “a 1918 trade catalog for children’s clothing recommended blue for girls. The reasoning at the time was that it’s a ‘much more delicate and dainty tone’. Pink was recommended for boys ‘because it’s a stronger and more passionate color, and because it’s actually derived from red. '” Wikipedia points out, “The transition to pink as a sexually differentiating color for girls occurred gradually, through the selective process of the marketplace, in the 1930s and 40s. In the 1920s, some groups had actually been describing pink as a masculine color, an equivalent of the red that was considered to be for men, but lighter for boys. But stores nonetheless found that people were increasingly choosing to buy pink for girls, and blue for boys, until this became an accepted norm in the 1940s.” So there you have it- our current gender norms for colors are actually relatively new. Much of the gender bias for pink, I believe, was reinforced by the Nazi practice of forcing concentration camp inmates who were accused of homosexuality to wear pink triangle patches. I say, since girls have clearly taken back blue (cough*ELSA*cough), let’s give pink back to the boys. As for me and mine, my Lil Fox can wear all the pink (and red, blue, green, purple, and yellow) that he wants. 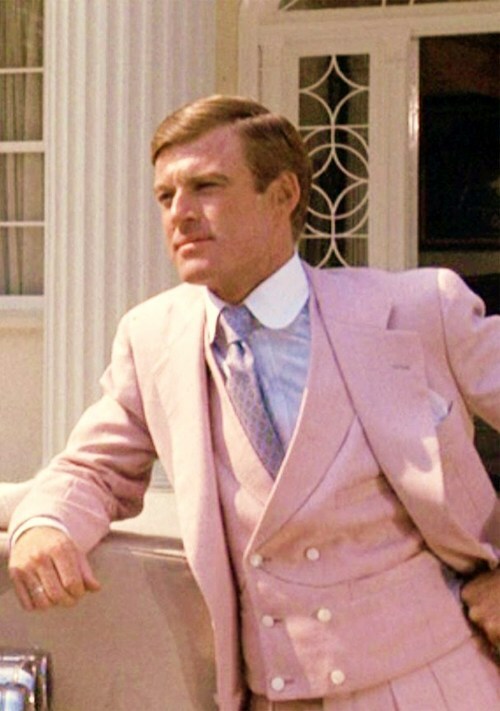 Here’s his pinkspiration, Robert Redford as Jay Gatsby in The Great Gatsby, 1974. Like hell he is! 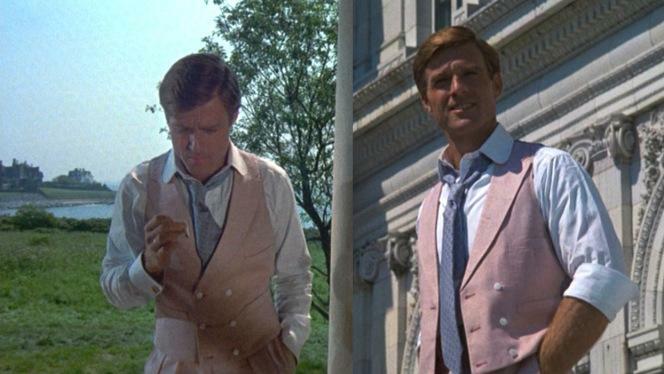 He wears a pink suit. Little Gentleman Suit Jacket by PeekABoo Patterns My only modification was to put the breast welt pocket on his right side rather than left since he is left-handed. I was a little nervous about making this, but I took my time (maybe 7 hours total) and it came out great. The details like the welt pockets, full lining, and back vent give this a jacket a mature, ready-to-wear look. The simplicity of the turned rather than notched collar helps keep this accessible for a newer sewist. I’ll definitely be making more of these in the future! Dapper Lad Vest by Ellie Inspired I left off the back ties, and did two double rows of white snaps instead of buttons. I deliberately made this pretty snug, but that meant it also came out a little shorter than I would have wanted. The pattern gives finished measurements rather than sizing, so I underestimated which size to make. I found the instructions for making this very unclear- after a few steps that left me completely baffled, I pretty much just made it up as I went along. However, I love how it came out, so I’m willing to give it another shot- and I’ll be sure to size up next time. Lumberjack Shirt by Patterns for Pirates I made the unlined version with contrast cuffs and collar stand. I also modified the collar points to be rounded, and took 1/2″ off each side of the back piece to slim in since I was making it unlined, and my shirting has just a bit of stretch to it. I debated quite a bit about which pattern to use- I also have Charlie’s Camp Shirt by Ellie Inspired and the Johnny B Good Hoodie by Shwin and Shwin, but ultimately I went with Patterns For Pirates because I always have good luck with her patterns and instructions, and the sizing was predictable for me since I have made a few others. I also knew I would have an easy time figuring out the contrast pieces that I wanted for this shirt given how well-written the instructions always are. Definitely check out this pattern because it comes with a lot of great options including a hoodie, and warm lining to make it into a casual jacket. Little Gentleman Tie by PeekABoo Patterns with no modifications. Another very versatile pattern with sizing from infant to tween, and options for neck tie, bow tie, and stacked bowtie, all with an adjustable neck band. This was a great opportunity for upcycling some ties that were in the bag for donation. If you happen to have a pile of neckties to get rid of, stay tuned for a future post on upcycling- I use mine to make bias tape and piping! Finn & Riley Pants by Pollywoggles Patterns Flat front option with no modifications. This is a very versatile basic pants pattern that includes options for all-elastic or flat-front waist, instructions for multiple lengths, contrast cuffs, and ruffle cuffs. I had a bunch of pants patterns to choose from, but chose these for their simplicity. I was on a time crunch, and the pants were the last thing to make. They took me about an hour and a half from start to finish- and if you are paper and ink-conscious and you’re comfortable with tracing your pattern pieces, definitely take a look. The main fabric for the pants, vest, and jacket is a dark pink/white stripe on seersucker, and I lined with a dual-faced polyester I had left over from Lil Foxes baby blessing outfit that is satin on one side, slubbed on the other. I couldn’t find any solid pink in the tone I was looking for- the closest was an upholstery velvet. That would have taken us to entirely the wrong era! The necktie was repurposed from one of Daddy’s, and the shirt was medium-weight white cotton/ poly blend shirting fabric I’ve had for a while. It’s butter soft, irons beautifully and has just the tiniest bit of stretch on the bias. It was very easy to work with, and I was glad to get it moved out of my stash because it did have some flaws and I needed a pattern small enough to work around the minor stains and holes in the fabric. Overall, I’m really happy with how this turned out, even if it’s just a bit more Fred Astaire than Robert Redford. I’m hoping it all still fits in a few months so it can also be his Easter suit. It’s also a sure winner for Oscar’s night. What do you think? Have I convinced you that boys CAN wear pink? If you think so, visit Mabel Madison and get 15% off your total purchase using code PINKBOYS for the month of February (I’m NOT an affiliate, but she has beautiful fabric!). Also, if you haven’t already, join the Sew for Boys Facebook group for lots of sewing inspiration for the boys and men in your life. And check out the awesome prizes below! International entries welcome, but winners outside of the US will be responsible for shipping of physical prizes. Winner will be notified via email within 24 hours of the end of the giveaway. If the winner does not respond within 48 hours, a new winner will be chosen. a Rafflecopter giveaway : this link works for the giveaway! Just no widget. Enter away! Love this, Lin! Sure looks like he is having fun playing model for you. Think I could make Cole a matching outfit … he’s 5’6″ now. Thanks Heather! He is a delightful model. I can’t believe Cole is so tall- you’d need a lot more seersucker lol. Suit jacket sizing goes up to 30″ chest/ 21″ long sleeve. Shirt 31.5″ chest/ 28″ waist; these pants are probably a no-go- max waist is 25″ but the length is totally adjustable (perfectly straight leg); the vest max finished measurement is 35″ with a 22 3/4″ length. So I think you could get pretty close! I just now noticed that the banding on the shirt collar is also in seersucker! Beautiful couture detail! Thank you! That’s primarily why I went with this pattern- I knew that detail would be very easy to integrate. The shirt cuffs are also contrast in the seersucker, you just can’t see them under the jacket. What a fantastic post and what a handsome model! Thank you Evin! It was a ton of fun putting this together! Super cute! I have the lumberjack pattern but have only used it for a jacket so far. Maybe I should branch out and make a buttonup too. You’ve inspired me! Oh my goodness I love IT! He and the suit are perfect!